Pizzeria Paradiso is partnering with Art Works to purchase a dual-use building in Prince George's County, Md. bringing much-needed fresh food and art to the community. Barbara Johnson was looking for a new home for Art Works Studio School, currently based in the Gateway District of Mount Rainier, Md. "We mix a social justice curriculum with visual arts education," Johnson, a native of Hyattsville told News4. The school paired with Pizzeria Paradiso to move into a dual-use building at 4800 Rhode Island Ave. in Hyattsville, Md. A new Pizzeria Paradiso is coming to Hyattsville, Md., bringing with it a partnership with Art Works Studio School. News4 Prince George's County Bureau Chief Tracee Wilkins has the latest details. "I think Paradiso is a neighborhood place and I think this is a great community, a great neighborhood, it's a natural fit," Johnson said. Paradiso is well-known in the DMV with locations in three affluent areas -- DuPont Circle, Old Town Alexandria and Georgetown. The partnership will extend Paradiso to Prince George's County, an area that was recently deemed a "food desert" by the USDA -- meaning its residents lack access to fresh food and restaurants. 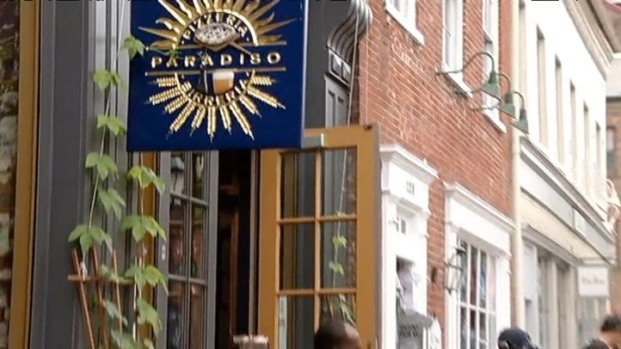 "It's got the growth, so it may be a risk, but I think it's a risk looking into," Paradiso Chef and Owner Ruth Gresser told News4. "The community response in Prince George's County and Hyattsville has been the most embracing out of all the locations," Gresser said. One side of the new building will be dedicated to art learning and sharing, and the other will be Paradiso's new home. "It'll feed both organizations so well, and it will, literally, feed the community," Johnson said. The restaurant is set to open its doors in 2014.